Footbag Foundations: Which footbag should I buy? Home > FAQ > Which footbag should I buy? WHICH FOOTBAG SHOULD I BUY? Photo: A Mr. Sandbag footbag, by Freedom Footbags. An easy answer to this question is Freedom Footbags' Mr. Sandbag. It is an overall good bag for beginners for a number of reasons: 1) it is very inexpensive, at a mere $7US, not requiring a heavy investment; 2) it is very durable and can last over a year or more! This is a significant statistic considering the short lifespan of a steel-filled, hand-stitched, 32-panel facile footbag; 3) it requires no break-in time. Another major downside of the aforementioned 32-panel bag is that it will often require weeks for the materials and stitching to break-in and provide ideal playability; 4) it is very playable, and often preferred over the 32-panel by top-level players. The Mr. Sandbag can be purchased from Freedom Footbags here. Photo: A Hania 32-panel footbag, by HaniaBag.com. Additionally, there are many criteria that should be considered in the purchase of a quality "32," in addition to stitcher, including: cost, weight, size, filler, fabric, stitch, and panels. The average 32 costs about $30US, which may seem steep, yet on average takes 2-3 hours to painstakingly hand-craft. Some stitchers, like Hania, often offer seasonal deals. The average weight of a 32 ranges from 50-70 grams. This can make a huge impact on play, depending on personal preference and external factors such as wind if frequently playing outdoors or in a particularly brisk climate. It is also important to note that the sand-filled Mr. Sandbag weighs a mere 42 grams. In the 1990s, the average bag weight was between 20-30g. Size is one of the most fundamental factors to consider. The average bag is about the size of a golf ball. Some players prefer slightly smaller, which can contribute to larger dexterity range and precision, at the cost of ease of delay; while others prefer slightly larger, which can aid in delays, proving more conducive for a less dexterity-heavy trick repertoire, where spinning and ducking tricks play a larger role. Most 32s are filled with some combination of metal shotgun shot, including stainless steel, lead, bismuth, and tungsten (generally at a size 7). These metals all have vastly different properties. Steel is the lightest, yet can be very prone to rusting. Lead is obviously toxic, although steel or nickel-plated lead is available -- this should be seriously considered in lieu of pets and young children who may attempt to eat the footbag. Bismuth and Tungsten are safer options with a hearty weight, yet they are extremely expensive and often difficult to obtain. Often a cushioning or volumizing agent is employed as well, such as light rubber scraps, plastic beads, or plastic poly pellets. Sometimes unique materials altogether are employed, such as small, smooth pebbles. Another important consideration in terms of filler is fill capacity. The average bag is filled halfway to two-thirds full. Fill capacity can affect play in a comparable manner to bag size -- a less-filled bag will stall more easily and a more-filled bag will have higher set precision. 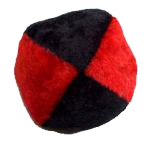 The average footbag is made of a synthetic suede called ultrasuede light, also known as facile. A major complication with facile is that every colour of the material has different properties. While a "Light Blue" may be very supple and increase playability, a "Country Cream" may be rather thick and take months to properly break in. If two such colours are improperly combined, a bag may very well begin to develop holes before it has fully broken in. Consulting your stitcher regarding suitable colour combinations can save a lot of hassle. Another viable fabric is amaretta, which is even thinner than facile, yielding increased playability at the understandable cost of drastically reduced durability. There are two common stitching styles today. The more common is 3-stitch, which produces tighter bleed holes that prevent filler leakage. 2-stitch bags have recently risen in popularity with both stitchers and players, however, since the former is able to produce them more quickly, resulting in a lower cost for the latter. 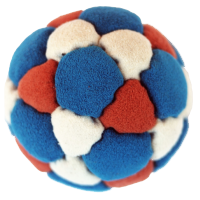 The number of panels used to create a footbag can also affect both playability and cost. 32 is the optimal number, creating the ideal balance between roundness (the same number of panels as a soccer ball) and suppleness. Any more panels will result in a much stiffer, less playable bag. Less will result in a bag that falls into the same category as less-filled and larger-sized bags -- they will stall more easily, yet provide decreased set accuracy and dexterity forgiveness. 8-panel and 4-panel bags (like the Mr. Sandbag) are common and will demand a less hefty coin. While a great player may swear by a certain footbag make, everyone has their own personal preference that may not coincide with the best player in the world. Tournaments are a great place to do some research -- join a variety of circles that use different bags to get a feel for your personal preferences and inquire about them with their owners. It is also important to keep in mind that at tournaments you will often be forced to play with a variety of bags, and so not limiting yourself to very niche preferences (such as a 70g, 64-panel amaretta bag filled with only tungsten) will be beneficial.